All dog walkers and pet sitters in Lake Dallas are employees of DFW Pet Sitting. They are bonded and covered by our liability insurance. We employ pet lovers who work in their immediate neighborhoods, usually within 5 miles from where they live. Our company monitors each and every assignment. Manager or owner are on call 24/7. All dog walkers and pet sitters in Lake Dallas live in your neighborhood near you. Finding a company that is reliable, local, established and professional will make your travel easy and worry-free. With the best dog walkers and pet sitters in Lake Dallas, we are here to offer you a worry-free pet care experience. Lake Dallas, Highland Village, Corinth, Lewisville, and Corinth are major areas that our Lake Dallas pet sitters cover. Your pet sitting and dog walking professional won’t drive too far to get to you, and you know: if it’s convenient for your pet sitter, you’ll have fewer reasons to worry that they will let you down. Plus, the manager on call monitors each pet sitter’s activity, and we make sure the schedule is followed thru. We offer pet sitting and dog walking services in all zip codes of Lake Dallas and all surrounding areas. Our dog walkers and pet sitters in Lake Dallas stay in their immediate neighborhoods and focus on quality pet sitting. Lake Dallas speaks for its name: it is a beautiful town on a lake. Those who love nature will certainly enjoy spending time with their pets in the great outdoors. Lake Dallas residents love spending time with their pets at Willow Grove Park. Willow Grove Park is very unique. 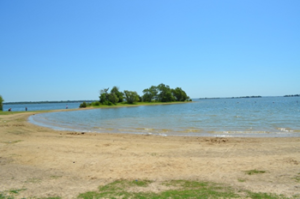 It is a gorgeous lakeside park with breathtaking views of Lake Lewisville. But it also has something very rare to offer: beaches. Yes, other lakes have beaches too, but nothing is in such ease and proximity to the city of Dallas. Lake Dallas pet owners enjoy this ability to grab their dogs, put on the leashes, and go for a nice walk barefoot. A leash is mandatory by the lake. But you and your dogs can still enjoy the cool water on your feet and a fresh breeze across your faces. There are so many activities at this park to enjoy. Fishing, boating, camping, hiking – you name it. It is a wonderful waterside spot. There is a fee to get into the park for camping, etc. so I would bring some cash just in case. It’s absolutely worth it!